The Encores! series is famous for bringing back musical chestnuts that often haven’t roasted on a New York stage in decades. Lo and behold, here comes Tommy Tune! While he’s been busy directing and choreographing (“The Will Rogers Follies,” among others), the impossibly tall dancer hasn’t appeared in a proper musical in New York since “My One and Only” — back in 1983. So you can see why the audience went bananas when Tune popped up in the latest Encores! production, “Lady, Be Good.” It’s hard to tell who he was playing, because this wackadoo 1924 show doesn’t even pretend to make sense. The screwball plot is merely an excuse to plug delicious songs by George and Ira Gershwin. Two of those went to Tune, white teeth a-gleamin’ and long legs a-ganglin’. 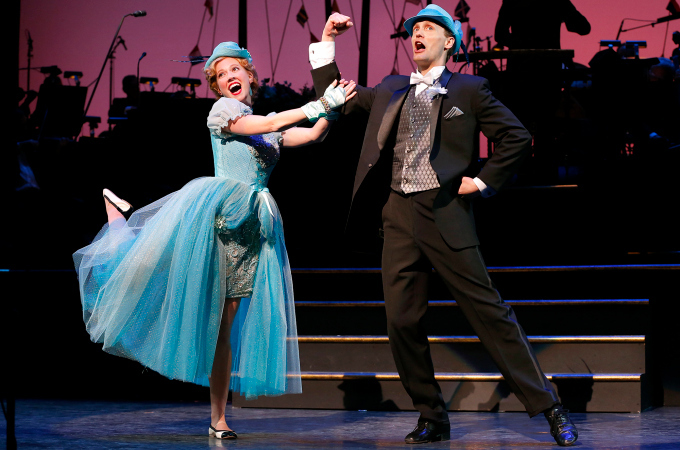 First it was “Fascinating Rhythm,” in which he casually sang and tapped before ceding the stage to the dance ensemble — Randy Skinner, of “42nd Street” fame, did the choreography. In the second act, “Little Jazz Bird” prompted a soft shoe so soft, it appeared to be in slo-mo. This 75-year-old guy was playing it cool. Tune’s presence was just one more slightly surreal element in the show, among the merriest, loosest Encores! offerings in recent memory. The original production was a vehicle for Fred Astaire and his sister-dance-partner Adele Astaire, who played penniless siblings trying to marry rich. In those roles, Patti Murin (“Lysistrata Jones”) and Danny Gardner have the energetic good humor required to sell numbers like the yodelling “Swiss Miss.” But while tireless and charming, the pair lacked that magical extra oomph that separates the very good from the memorable. The same can be said of the cast in general, including the indefatigable Douglas Sills as a suave shyster (“an hour with me, and they’re a woman with a past”) and handsome Colin Donnell as a hobo with a secret. Donnell and Murin actually performed one of the evening’s highlights without trying too hard, summoning a period feel for the lovely duet “So Am I” that transported us back to a more carefree, more romantic era. For that alone, we can never thank Encores! enough.